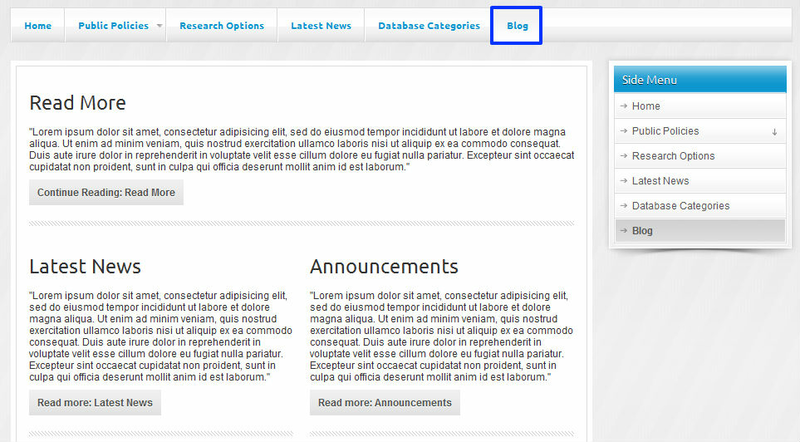 A Category Blog is useful Menu Item Type that is very similar to a Featured Article Menu Item Type. Both will display Articles that are saved into individual Categories, with one main difference: the Read More function. You can insert a Read More button into any Article, but it will only appear if that Article is linked to a Category Blog Menu Item Type. 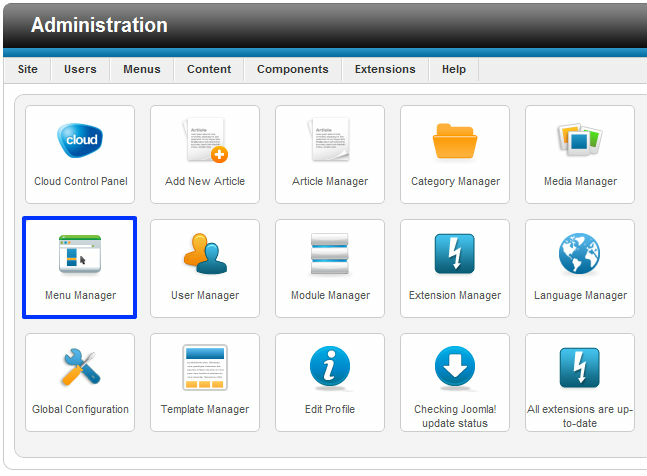 This article explains how to create a Category Blog Menu Item Type. Before creating the Category Blog Menu Item, you should create a separate Category and save the Articles that you d like to display into that Category. It may be helpful to name the Category "Blogs"; that way, you ll be able to identify it easily when you create your Menu Item. Related Resources at the end of this article can help you to learn how to create Categories and Articles if you re unfamiliar. After logging into the back end of your site, go to the Menu Manager. Select the Menu Item where you d like to create the Category Blog Menu Item type and then select the New button in the toolbar to create a new Menu Item. Paying attention to Red Asterisks, click on the Select button that is next to the Menu Item Type field. 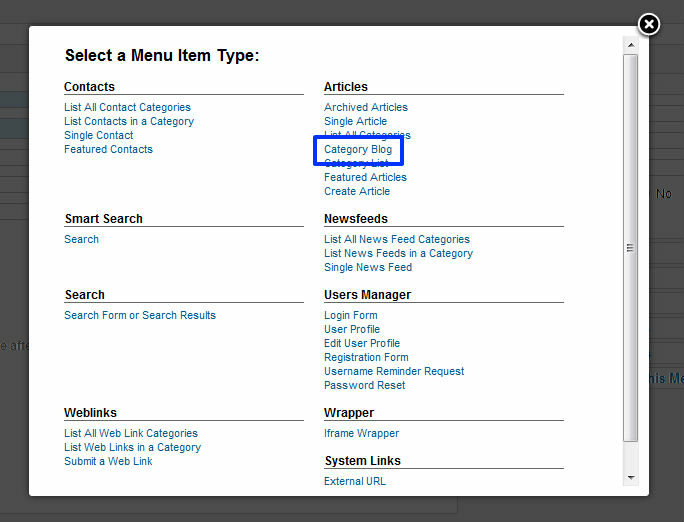 And select Category Blog from the list of Menu Item Types that appears. 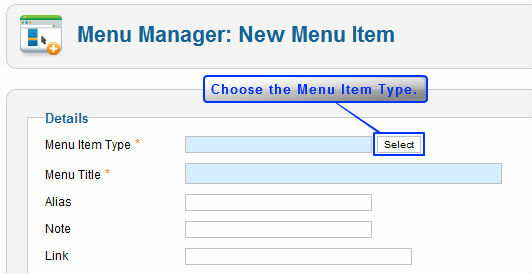 Complete the Menu item by creating a Menu Title selecting a Menu Location, and under Required Settings in the Parameters Area, select the Category where you saved the Articles that you d like to display when this Menu Item is selected by a user. Be sure to save your work. Return to the front end of your site, refresh the page, select the Menu Item you created, and you can see the Articles you saved into the Category you selected as you created the Category Blog. In the image below you ll notice the Read More button. Read this article to learn how to add the Read More button.